Is a freelance writer and school teacher living in Adelaide. On weekends I like to get out and explore with my family. I love travelling and have lived in various cities. 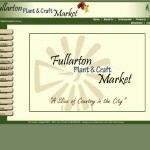 On the 4th Saturday of the month, you will find a delightful market nestled in the leafy gardens of Fullarton Park. This market has real atmosphere when compared to your average carpark market. The market is held in the gardens surrounding the Historic Fullarton Park Centre. Stall holders make use of the shade of hundred year old trees, making it an especially lovely market to visit in the warm months. There is always a huge selection of handmade crafts and gifts, rare and unusual plants, farm fresh foods and a multicultural food area where you can taste the flavours of exotic locales as well as a standard Rotary Club sausage on a slice of bread. Grab yourself a strong coffee at the coffee van first thing Saturday morning and then spend some time shopping for gift ideas, meal ideas, a few plants to liven up your garden and general market bric a brac. There are usually a few stalls to attract the kids and as an added bonus there is a little playground to keep the youngest in the family happy. I have been thinking of going to this and will now check it out.